On sale! (normally $89) The all-new ROG SLI HB (High-Bandwidth) Bridge doubles the available transfer bandwidth of the previous generation to deliver gloriously detailed graphics and silky smooth gameplay. 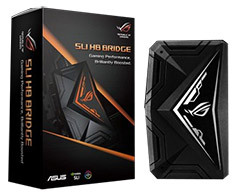 The ROG SLI HB Bridge features ASUS-exclusive Aura RGB lighting that displays millions of colours to express your unique gaming style, and Aura Sync technology that perfectly synchronises lighting for a system that really shines. 3-Slot spacing.